So here I am again faced with learning how to walk for the 5th time in my life. 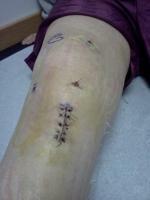 This will be my second ACL reconstruction on the same knee. I feel more aprehensive about it than I did the first time. Sometimes ingnorance truly is bliss. The first time I had really no idea what I was getting into. I just wanted to be fixed and able to play sports again. My first injury was a complete rupture of the ACL and MCL, no meniscal tears at all. My leg was blown up like a balloon and I rehab'd the MCL for 8 weeks and then had surgery. I used a patellar graft for my first reconstruction and rehab was very different than it is now. I was very self disciplined and had a fantastic recovery. I was able to walk with a funny gait, no crutches and drive my manual transmission car 8 days post-op. I returned to work missing only 5 days of work with no crutches. I gained full range of motion and returned to vball 5 1/2mo post-op!!! That ACL graft held true and strong for 10 years until I re-injured it in vball, again! I'm a very active person, running half marathons, biking centuries and continually playing vball 2-3x a week. I never had any problems with my reconstruction and was very happy with the results, strength of me knee and agility! nervous about infection, rejection and filling in the tunnels from the previous graft. I'm still fairly young and healing should be quick but I'm still very nervous about the amount of work that needs to be done. I'm also very mixed about the rehab. I had a fantastic rehab with my first reconstruction which was very aggressive and when I speak to PT's today about my previous rehab, they are alarmed. But I had such great success with it. No issues at all..I worry about my new rehab as I have a feeling it will be much more conservative than I'd like. While I completely understand the reasons for conservatism it's also hard to swallow given the success I've had before. I realize I will only be able to do what my body tells me I can handle. But what I can handle can be a lot. The last few weeks I've been jogging 6-7 mi a week and biking about 10mi a week with no brace. sounds dumb I know...but I actually have little to no pain, slight swelling and improved mobility. I haven't tried jumping or cutting or anything like that but running doesn't feel uncomfortable at all. I hope that my surgery tomorrow is as successful as the first. I will be sadly disappointed if it's not. But time will tell. If anyone has experience with a second surgery on the same knee I'd love to hear about it. I'm really concerned about having the screws removed, tunnels packed and then having the new graft screwed in. Any advice or stories would be great to hear.